All trips open to anyone, free of charge (gas costs for carpooling on long trips may be shared). Please check back periodically for changes and additions. See below for our currently planned trips, please check back later for more or changed trips or details. We request that people minimize conversation when we’re actively birding as a group (harder to hear and focus on the birds). April 18th, Bradbury Mountain hawk watch with Lionel Quirion. Same arrangements as for the original date; i.e. Carpoolers: meet at 8:30 am at Gardiner Hannaford parking lot, between the two entrances on the river side. Or, meet at the parking lot at Bradbury Mountain ~9:30am. *We will tentatively plan to end around 1:00 pm, unless the hawks are numerous, in which case we may choose to depart later. Feel free to join us at the hawk watching site for any portion of this morning and early afternoon hawk watch. We’ll walk up the Summit trail from the parking lot, about 0.3 miles long, to the ledge clearing above. Link to map. Please bring lunch, water, binoculars, sunscreen, and anything else you might need to be comfortable. Restrooms only in the parking lot; none at the top. Maine Bird Atlas training by Maine Audubon, Sunday, April 28 from 9:00 until noon at Viles Arboretum in Augusta. There is no fee for the training. This in-depth training will be focused on how to document birds during the upcoming breeding season. It will involve an overview of the project, including background and objectives, explain various ways to participate, and take a hands-on look at how to use eBird (the database for collecting Maine Bird Atlas sightings). May local warbler walks at Viles Arboretum and other locations, weekdays at 7 a.m. from Monday May 6th to Friday May 24th. Tuesdays through Thursdays will be at Viles Arboretum, 153 Hospital St, Augusta. Monday May 6th and Friday May 17th, Hallowell Reservoir Road, park off Town Farm Road where Reservoir Road starts (before the gate). Friday May 10th and Friday May 24th, Bond Brook Recreation Area, meet in the large parking area at the bottom of the bowl/stadium (end of Tall Pines way off Bond Brook Road). Monday May 13, Howard Hill, meet at the Hallowell access at the end of Coos Lane (behind the large low brick building) off Winthrop Street. Monday May 20, Augusta Nature Center, meet near the greenhouse in the parking lot at the left (south) of the buildings that comprise the Capital Area Tech Center and Cony High School. From downtown Augusta (east side rotary), take Cony Street, turn left onto Pierce Drive and take the first left to get to the parking lot. Bird Day! Sunday May 19th 8 am – 12 pm. Kids and family bird day activities at Viles Arboretum, West Room and outside to celebrate resident and migratory birds. 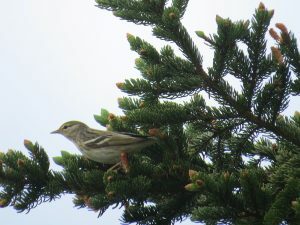 May is the month in Maine when the birds come to you (some migrating toward Canada and some nesting here). 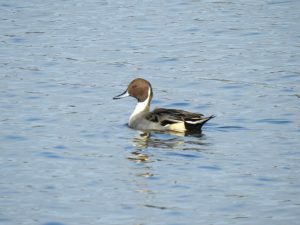 The Augusta Bird Club and Viles Arboretum will celebrate International Migratory Bird Day on Sunday May 19, 2019 by offering a morning of bird observations and activities. The activities will begin at 8 a.m. with hourly bird walks led by Birding Club members. All ages and abilities are welcome. From 9:00 a.m. to noon, in the West Room and Viles grounds, visitors will be able to obtain information on local birds and bird-watching opportunities and explore bird characteristics. Migration Exploration- Ospreys and Alewives. 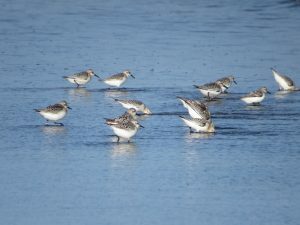 Celebrate spring and the return of birds and sea-run fish to Cobbossee Stream by hiking the Harrison Avenue Nature Trail with Maine Master Naturalists and Augusta Bird Club members. 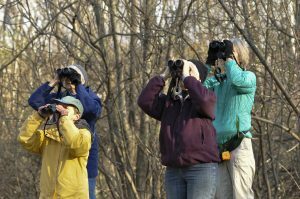 Bring binoculars and park at the New Mills Dam parking lot on Rte 126/Cobbossee Avenue in Gardiner for this one mile hike. Free and Fun! Monhegan trip, Friday May 24, we’ll leave very early to catch the first boat out of Port Clyde and return in the afternoon. Monhegan tends to get very good migrations of birds landing on this island twelve miles out to sea. This will be toward the end of migration and will favor later migrating birds. Mt. 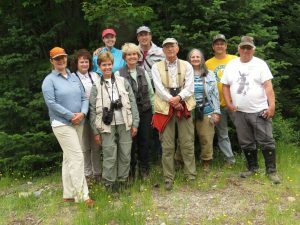 Abraham hike, Saturday June 8th, for boreal birds, hopefully including Bicknell’s Thrush. Will leave Augusta area at 5:00 am sharp. We haven’t done this hike before and we won’t be scouting it beforehand, so it may be very good or we could have unexpected disappointments. High-clearance cars will be needed to get to the trailhead so we’ll be coordinating cars; we’ll need to know who’s coming ahead of time. Clary Hill migratory hawk trip, Sunday September 15th, weather dependent. Leave Augusta or Gardiner at 9 am. Sabattus Pond duck migration, Saturday, November 9th, weather date Monday November 11th. Several ABC members braved the high seas (was actually fairly calm that day) in hopes of seeing the Red-billed Tropicbird at Seal Island. It’s a rare bird in the North Atlantic but one bird has been returning to Seal Island (south of Stonington) for a dozen or so summers. It can be disappointing to focus an entire trip on one bird and we did expect to see other good pelagic species. Happily, the Tropicbird did make an appearance and we also saw Great Cormorant (unusual breeders in the U.S.), Razorbill, Atlantic Puffins Common Murre, Manx Shearwater, Wilson’s Phalarope, and Arctic Tern among others. 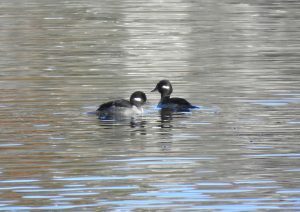 Ten of us had a good day birding in the north woods, on and near the Long Falls Dam Road near Flagstaff lake. We saw 58 species overall and a good variety, though fewer true boreal birds than we were hoping for. 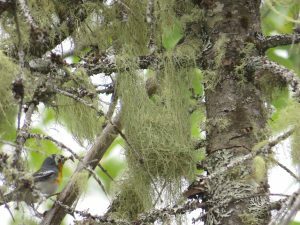 Highlights included Mourning Warbler, Boreal Chickadee, and Black-billed Cuckoo. Monhegan Island, May 2018: Eleven of us had a great time on Monhegan (except for the rough ride over) and spent most of the day out there. 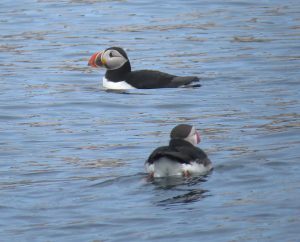 We saw 58 species of birds, including Blackpoll Warbler, Tennessee Warbler, Blue-gray Gnatcatcher, Philadelphia Vireo, and Puffin and Northern Gannett on the trip back. Much gratitude to Howard Lake for initiating the trip and gathering information from several recent visitors there, so we could make the most of our time on the Island. 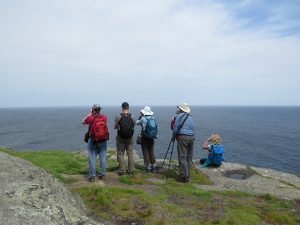 All birders agreed that we should make this Monhegan trip an annual ABC event. Long Falls Dam Road Trip near Flagstaff Lake, March 2018: 12 birders traveled to Somerset County on a quest for crossbills and other boreal species. We were thrilled to observe a total of 24 Red Crossbills and 5 White-winged Crossbills – more Crossbills than any of us had ever seen in a single day. Also fun to see were 44 Pine Siskins, 12 Red-breasted Nuthatches, a Ruffed Grouse, and an adult Bald Eagle soaring overhead – and other more usual species. On the way home, we stopped at the Messalonskee boat launch in Belgrade and were pleased to see a Northern Harrier soaring over the marshes, and a flock of 13 springtime Red-winged Blackbirds flying by. One of the purposes of the trip was not only to see crossbills, but to record their calls, with the intent of forwarding the sonograms to Cornell Researcher Matt Young for his analysis of which of the ten Types these crossbills represented. 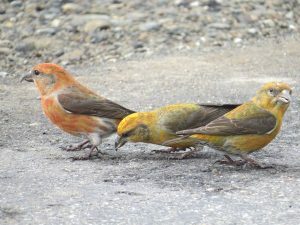 The usual “type” for Maine is #10, known as the “Sitka spruce” type and, indeed all of the Red Crossbills were observed in high concentrations of Red Spruce. However, Matt confirmed a Big Surprise – that 4 of the RECRs were Type 3 – a species found usually in the Hemlocks of the Pacific Northwest (but which are also highly irruptive). These Type 3s are apparently only the third time that Type 3’s have been documented in Maine, the first two on Monhegan in the fall/winter of 2012/2013. 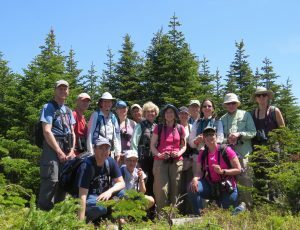 We had a fun day of birding at Kibby Mountain, June 2017. Quite an adventure as you take a right just before Quebec and go 10 miles down logging roads to the trailhead. Fifteen of us made the trip. Despite the wind and the heat, which probably kept some of our target birds well hidden, it was a wonderful day for a fairly bug-free hike with some great people. The highlight for many of us was the very cooperative Mourning Warbler along the Gold Brook logging road. This is a difficult bird to find, let alone photograph. Another highlight was hearing Bicknell’s Thrush at the top, amazing for the middle of the day and so warm and sunny. We had 35 species for the trip, including Blackburnian Warbler, many Blackpoll warblers (most heard, not seen), Swainson’s Thrush, Philadelphia Vireo, Yellow-Bellied Flycatcher, and Rusty Blackbird.